Runway is very much strong. Bakeris are well reputed family from Gujarat Business Circle and every word they speak is to be taken seriously. Hoping them to continue the repeat of past performance for quite a few years. 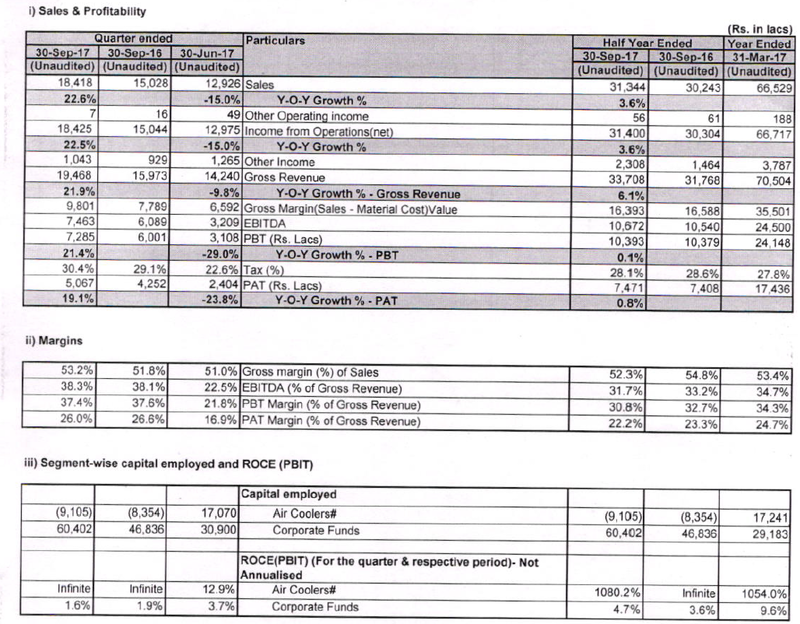 Co has also announced a Rs 2 dividend. 35% increase in Revenue & net Profits is fabulous. More than decent, Sir, in my opinion. Not many companies showing such performance. It's been a roller-coaster ride for the real estate heir, but a great one nevertheless. Today price has suddenly gone up by about 10%. any specific reason or information, if any one has? Nrupesh Shah interview on Q3 results. Affected by demonetization, but confident to maintain the growth momentum ahead. Non-cooler segment growth was at 40% and centralized air-cooler had growth in triple digit albeit on lower base. Marching ahead as usual. Many Triggers to make it above average runner for next few years. GST, China Acquisition, Industrial cooling, Electricity Availability reaching small towns, People with AC going for Cooler for comparatively open area of house like dining/drawing room etc. Symphony results… surprise fall in quarterly profits attributable to introductory pricing of new products. Detailed note explaining that demand still intact… all is well. As part of the Results published, there is a Brand Report as well (Pages 8 through the End). Definitely worth a read - Loved the way the company has detailed out the numbers, key business decisions taken, future potential etc. Obviously we need to watch the performance closely in the coming Quarters / Years, as it’s our hard earned money that we are investing. Slowing topline growth may also signify the balance is tilting in favour of AC players. I personally believe there is huge scope for growth for both but which one would be more I am not sure. I am more interested in where my RoI opportunity is higher. Huge Runway in terms of market size. Unit Cost is affordable for Large indian house holds. Particularly considering operational cost. Industrial/Package Air Cooler is totally un explored but high opportunity market. Movement of un-organised market (~60%) is sure shot to happen in next few years. With all above (and many more) points if u combine Symphony Balance Sheet strength, Management and Execution Quality, it is best combo to have. Ofcourse, at what price it makes sense is a different point. Also it will hv different meanings for people holding it and for one taking new position. I will strongly suggest to go through last 5 years AR, Earning Calls and assess what is said v/s achieved. Discl: One of my top holdings and hence may hv many biases like Association Bias etc. Safal Niveshak shares the review of FY17 annual report of India’s leading air cooler company, Symphony Ltd.
Good analysis felt worth sharing. Interesting to see Symphony being granted a patent for its wall mounted cooler in South Africa. Also they hv come out with Gesture Controlled Models. Converting Commodity (Road side selling item in Delhi) to Super Brand!